You must be a member of the Munich Indian Curry Connected Group to attend this activity. Would you like to join this group? together by a popular team of International artists. It is our way of paying tribute to our great nation on Republic Day. Over the course of 2.5 hours, you will be entertained and mesmerized by live Bollywood music and beautiful dance performances. 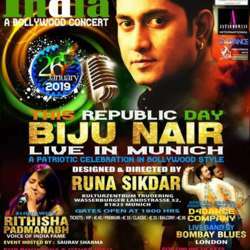 The concert includes Bollywood songs of all genres, including a special segment of patriotic songs as well as modern songs. In addition, there will be a number of intricate dance numbers performed by the professional D4Dance team & special singing segment by Soul Sargam music band from Munich. All tickets & passes include an array of delicious Indian Buffet as well as entry to the event. Please feel free to get in touch if you have any further questions about the event. We hope to see you there!